Regional climate models (RCMs) provide information about the meteorological aspects of climate change. To prepare targeted and sustainable adaptation strategies, it is indispensable to know the effects induced by meteorological changes in detail. All this requires quantitative impact assessments. At the Hungarian Meteorological Service (OMSZ), links with the users of RCM data have been continuously sought and co-operations have been established on the same professional basis (Figure 1) since beginning of the climate dynamics activities. 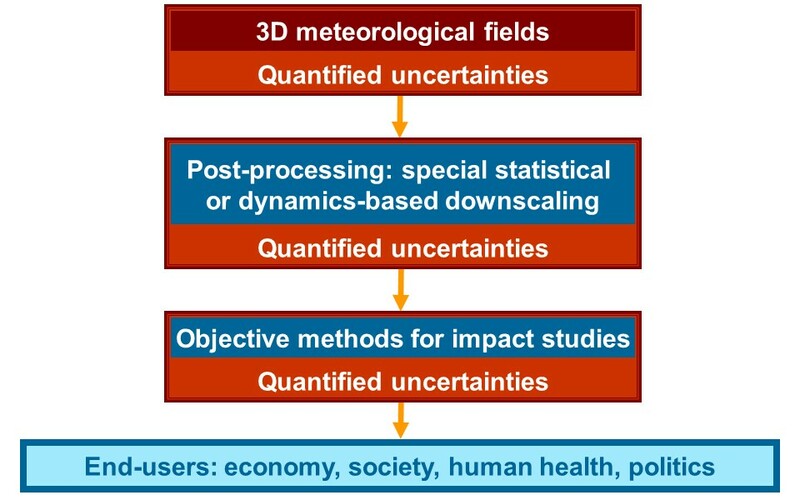 The quantitative and detailed meteorological information desired for climate impact studies are ensured by RCM outputs, directly or after some post-processing steps. Climate change affects various sectors (e.g., human health, agricultural production, natural habitats), consequently, climate data users also have diverse needs and preparedness. Therefore, gathering the input data for impact assessments is a multi-step, iterative-consultative process, during which the user requirements are harmonized with the limitations and the possibilities of RCM data. The actual outcomes always reflect the current state-of-the-art in science. For correct understanding of the results, uncertainties in the applied data and methods are indispensable to be considered. Since the projection uncertainties are quantified using a set of model simulations, also impact investigations have to be based on an ensemble of input data. Users and decision makers are supported with trainings and consultations in right interpretation of the results. Model data of OMSZ were used first in international climate impact studies, while adaptation strategies in Hungary mostly were based on qualitative conclusions or a scenario considered intuitively as most likely. Efforts to provide a consistent, objective basis for climate impact assessments have been started only in the last few years. The National Adaptation Geo-information System reached its operational phase in 2016 to support the climate adaptation strategies and related decision making. The future climate projections of NAGiS are based on outputs of the ALADIN-Climate and RegCM regional climate models (Sábitz et al., 2015, Szépszó et al., 2016). Urban impacts of climate change. Results of the ALADIN-Climate model simulations with the medium SRES A1B and the pessimistic RCP8.5 anthropogenic scenario forcings, results of the RegCM model simulations with the medium SRES A1B and the optimistic RCP4.5 scenario forcings.